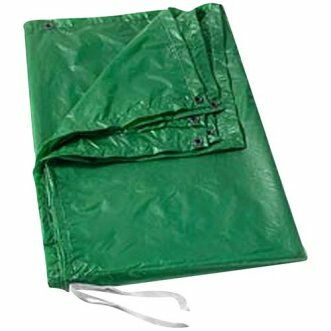 Waterproof 1.1 oz ripstop nylon tarps with silicone coating. Very lightweight - sizes range in weight from 9oz to 18.8oz. All sizes have reinforced grommets spread approximately every three feet. Key seams are double stitched for strength. Comes packaged in its own reusable mesh bag with drawstring and cord lock. Manufactured by Equinox.